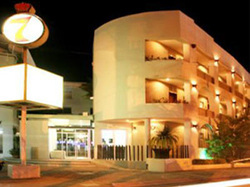 This hotel is located in the entry of the town, 5 minutes away from Center town, marina and our shop. Packages are based on double occupancy. *Local and Corredor dives (2 tanks dive per day). *Dive guide, tanks, weights, purified bottle of water. *Double occupancy ( minimum 2 divers)/( 2 adult and 2 kids in the same room). *Internet dial up and wireless free in your room. 4 nights/ 3 days of diving $776 u.s.
5 nights/ 4 days of diving $1021 u.s. Dive expeditions, night dives and courses can be added. Dive gear rental $30 dollars a day, per person.